2JR Nismo Intake relocates the filter outside of the engine compartment to deliver cool air inlet temperatures. Cooler air carries more oxygen, which translates into a more intense explosion in the combustion chamber to create more horsepower and torque. But that's only part of the power equation. Tuning the inlet pipe in length and diameter to match the engine's resonance helps move more air to the cylinders (think of your engine as a big air pump), and this tuning allows us to deliver large power gains. We also monitor fuel trim correction factors and all OBDII sensors during product development to eliminate leaning the engine out and/or throwing a check engine light. Polished Intakes being shipping on July 15th! 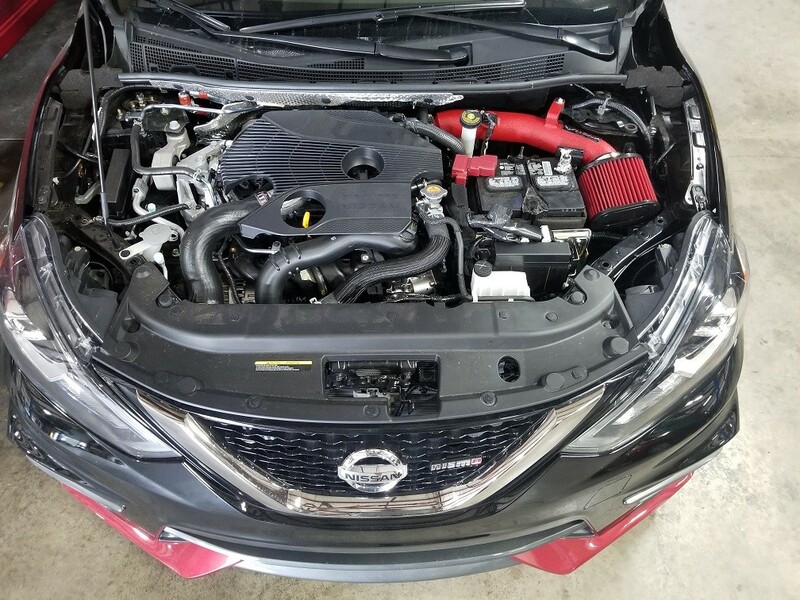 Sentra SR/Nismo/Juke Cold Air Intake - 2JR Nismo Intake relocates the filter outside of the engine compartment to deliver cool air inlet temperatures. Cooler air carries more oxygen, which translates into a more intense explosion in the combustion chamber to create more horsepower and torque. But that's only part of the power equation. Tuning the inlet pipe in length and diameter to match the engine's resonance helps move more air to the cylinders (think of your engine as a big air pump), and this tuning allows us to deliver large power gains. We also monitor fuel trim correction factors and all OBDII sensors during product development to eliminate leaning the engine out and/or throwing a check engine light.